My best friends name is Waldo, we have been friends for over 15 years, and have spent everyday together. Waldo is my dog but more importantly he is family. 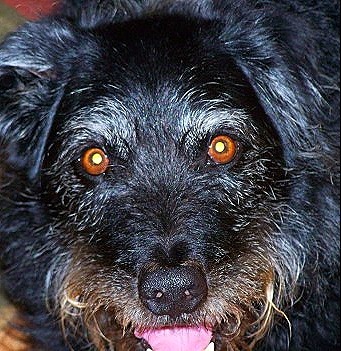 Waldo is a terrier mix, basically a mutt, he is a medium sized dog, about 55 pounds. So for his size he is old. Based on dog years he is about 100 years old, give or take. Up-until about two or three weeks ago he was basically healthy. I did have a scare about 18 months ago where I had to rush him into the vets for issues with his balance, it turned out to be an ear infection, but it still scarred me. The thought of no longer being part of my daily life is a thought that I do not cherish. But it is one I have to come to, his time is running out. Last week I had to once again rush him to the vet. I arrived home about 9:30 one night to find Waldo spread eagle on the floor unable to stand or walk. He is now of a few meds and basically can walk. He has issues on slippery floors but on carpet he is mostly ok. I have hard wood floors through out the whole house with areas of rugs. So he has issues, I do what I can, I have placed rugs by his food and water and we, my nephew and I watch over him. But each day he seems to have new issues with his ability to stand or walk. Over all he is otherwise healthy, but old. This morning I was reminded of his issues, not that I have forgotten. When I woke up I gave him his breakfast and him meds that I mix in to his food with gravy or applesauce. Why he was eating I went to save and shower and get ready for work when I heard him crying. I found him spread eagle on the floor. The cry was one not of pain but more one of confusion and scared. It was a sound I never want to hear again, it was a sound of total desperation. When I ran to him He was looking at me for help and understanding and I at him with a look of fright and love. The thought of his passing is one that haunts my dreams and my waking hours. This is the sadness that I will have to deal with over the next few weeks and months. Not to long-ago I lost my other dog, George, a few moths back. February 12 of 2010 George drowned in my back yard pond. And the memory is still vivid in my mind. The loss of a pet to some is nothing more than a loss of a pet, but to me it is a loss of a family member. George was eight years old when he drowned, so for eight years he depended on me and the feeling of failing him was over bearing. Waldo is 16 or 17 and has depended on me for 15 years. I saved him from the humane society days before he was to be put down. And in a way I have that feeling of letting him down because I can not protect him nor save him from what is to come. I have loss both of my parents and a 23 year old nephew, so I know the pain of loss of loved ones. I would place the loss I feel for George to be on par as to the loss of my loved ones. The loss of Waldo will be felt deep within my heart and soul and my world will change forever just like it did with the loss of my father and than years latter my mother. The loss of any loved one is devastating at best. With the loss of my parents I have learned to celebrate the lives rather than morn the death. Yes I felt a profound emptiness and a deep sorrow that rocked my world. I cried and questioned God as to why He would take my parents at such a young age, but ultimate I celebrated the life they lived. I thanked God for the time we did have together and prayed for there souls. The same can be said for George, I cried and questioned and I cursed the pond that took his life. But in the end I thanked God for George and the happiness he brought to my life. I look at my pond with memories of George and how he loved to swim in it, chase the fish and turtles. Waldo has and continues to bring me great joy. His personality is truly his and his love and devotion to me and the rest of my family is amazing. The joy he has brought into my life are too numerous to count and the idea of him no longer being their is to hard to phantom. I know that God is with me, and that He will help me through the next few months of uncertainty. I also know that one day soon Waldo will no longer be waiting for me at the fence when I arrive home, he will no longer bark and anything that happens to pass by and he will no longer be at my side. God willing he will pass in his sleep with no pain, God willing I will be there for him when he needs me the most. And God willing I will be able to comfort him in his time of need. The joy that my family and friends, including Waldo and George, have given me over the years have helped to create the person I am. With the passing of ones that are close to me I experience a great conversion of faith. I feel the hands of God upon my shoulders providing me the strength and comfort I need. I know the same will be true when Waldo is taken home. This knowledge does not make his passing any less painful, but it does help in the healing process. In Gods ultimate wisdom He knows the big plan for my life, and how each person and pet fits in to it. As for me, I am along for the ride, living my life to the best of my ability, taking each person and pet that comes into my life as a blessing knowing that one day, sooner or latter, they will be taken home. Some before me and others long after I have gone. It is a privilege for me to have had the past 15 years with Waldo, I feel honored to have taken care of him and to have him depend on me as much as I have depended on him. The joys of sorrows of life are the ebb and flow of our existence, and it truly is a blessing to be experienced. The goodbyes are always hard but necessary, for every time there is a session, a session for joy and a session for sorrow. Soon I will be experiencing two passing’s, on of joy and one of sorrow, a graduation and a death, life is full of opposing forces. Please pray for both my nephew and Waldo, that they may both my be blessed as they both experience a life changing event, one in to adulthood and one into the next world.